“Some people think that football is a matter of life and death; I think they are stupid. Football is far more serious a subject than that!” Those were the words of Bill Shankley. You will often find them in the humorous quotes section. But I found no quote more appropriate to start off this post after the recent events in Egypt where 13,000 home fans stormed the football pitch in Port Said armed with knives and machetes claiming the lives of 74 young men. Loyalty to country and to football club! These are the two loyalties in Egypt which cross sectarian, social and class structures. The main flag and the sub flags. But it was still hard to write about football, fans, revolution and death all in one post. It wouldn’t have readily occurred to me what they all had in common. However, links between football and politics are not new – some more serious than others and some more deadly than others. Egypt is not unique in this. Keeping aside the difference in detail and circumstance, one only needs to remember the infamous Winnie Mandela’s United Football Club and their bloodthirsty rhetoric in South Africa. Winnie’s bittering relationship with the Mass Democratic Movement in the 1980’s involved the conflict centered largely by her infamous Mandela United Football Club. Coincidentally, the Port Said disaster took place on the first anniversary of the camel battle of Mubarak’s loyalists into Tahrir Square. It made the seventy-four deaths personal to those holding not only the football team flag but also the flag seen at the top; the flag held over and above. The ultras had used their experience confronting police at matches to play a significant role in defending Cairo’s Tahrir Square – the heart of the Egyptian uprising – against Mubarak’s security forces. Many on the streets saw the deaths of the Ahly Ultras as punishment for their role in the revolution and not an unfortunate accident. 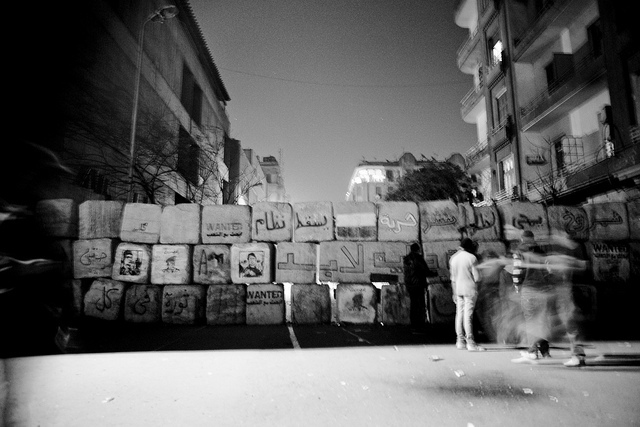 Tahrir Square once again became the home of the angry, the bereaved and the helpless. Rivals Ahly and Zamalek put hostilities aside and fans stood side by side once again at the frontlines. 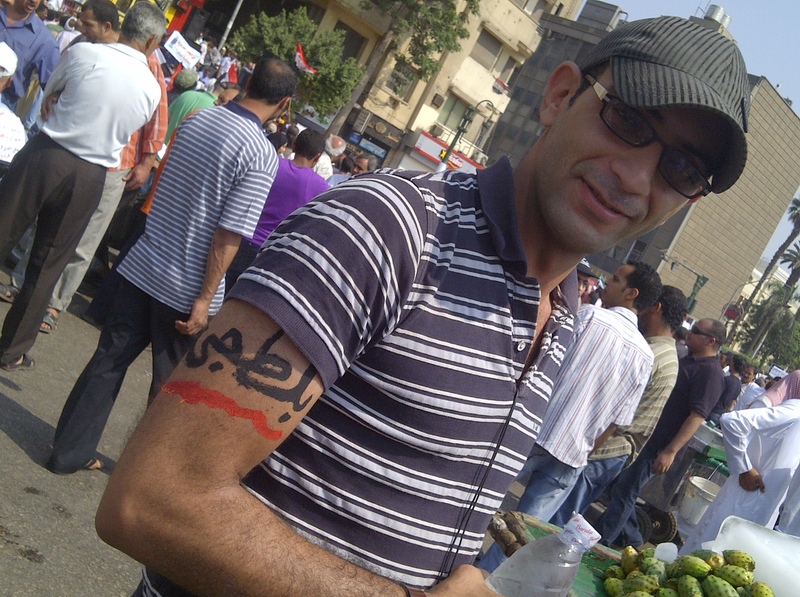 They marched from outside their respective clubs to Tahrir and, faithfully, Egypt demonstrated its solidarity. 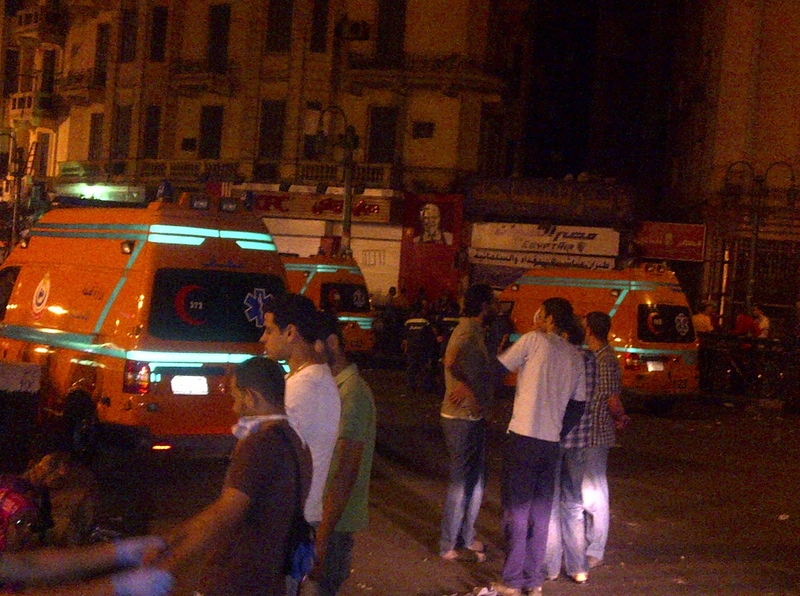 Again the square made its calling and again it claimed more lives – at least four more people were killed on Friday and the Ministry of Health announced around 1500 injured between Wednesday and Friday. 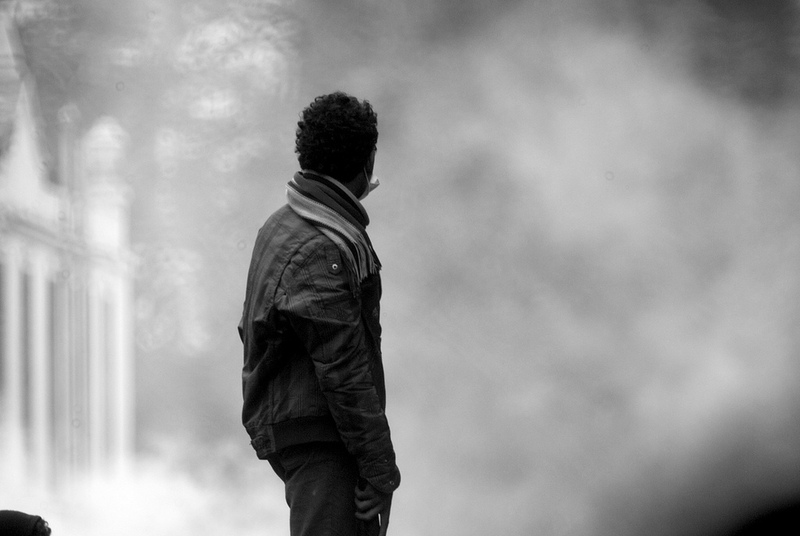 The lack of security has been at the centre of public debate since the overthrow of Mubarak. It has been the reason the silent majority has remained silent; in hope that quietening the revolution would have it returned. But, subsequent disorder, from attacks on Coptic churches to the abductions, robberies and muggings, has been seen as characteristic of deeply uncertain times. 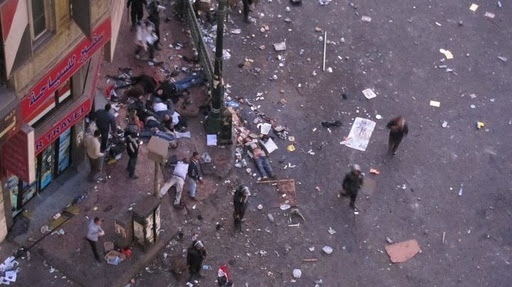 Whether or not the Port Said massacre was deliberately coordinated should not be the focus. The truth of why this happened may always remain unknown, but how it happened is clear: in a city where the head of security was changed four days before the match, in an audience that did not include any officials, 6000 men, without tickets, were allowed into stadiums with weapons, doors were closed on an unarmed crowd, and as a result 74 young men were stabbed and crushed to death. Whether the conspiracy theorists have, or haven’t got it right, responsibility for the Port Said events should lay with those who claim responsibility for the countries safety and security. Failure to acknowledge this, on the part of the government or the people, poses further threat to the future of Egypt’s stability. The police know, from past events, that they will not have to answer for the fatalities. The massacre and the lack of responsibility raise grave issues of competence, accountability and trust. Political crime or football riot, the consequences will have a big part to play in the fast paced shifting of Egypt’s political landscape. 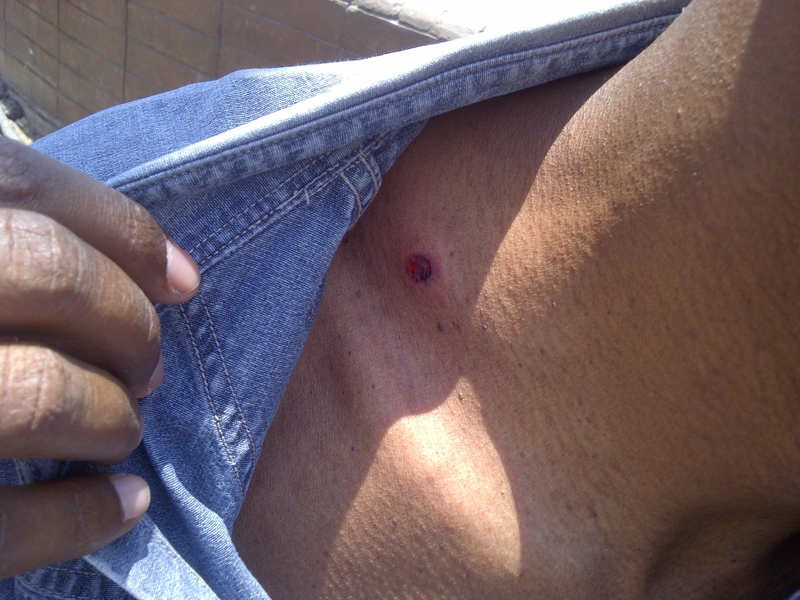 Blood is often not given time to dry in Egypt before the betrayal of authority and the silence of the majority begins. It’s because both have not been close enough to smell that blood, to have it splattered on them while they help those braver than they are, to have pleaded for it to stop the death of a friend, to stare at it dried on the clothes they were wearing when attempting to be more influential than the laws of the universe. They betray that which has not hurt them, and that which has not been directly relevant. They forget the closeness of those who have. There is much that revolution steals from the country it comes to free. 2011 is proof. The very first day of the year the Two Saints Church saw a bombing that cost the Coptic community around 40 of its congregation celebrating the New Year. The Muslims came out in their thousands condemning the act, that the betrayal was not in their name. Then, 7th January, the Orthodox Christmas saw churches in Egypt surrounded by Muslims holding hands making sure the Christians felt safe inside the churches if not their country. Some say that how this catastrophe was dealt with is worthy of celebration. That this is how the Egyptian come together in distress and show the best of solidarity. These shows of solidarity are always moving, always necessary and always temporary. The events of this year moved at a pace too fast for anyone to stop at any one disaster; too fast for those who needed sympathy over the loss of a loved one to receive it before they found they had to be offering it to someone else with a more recent loss. 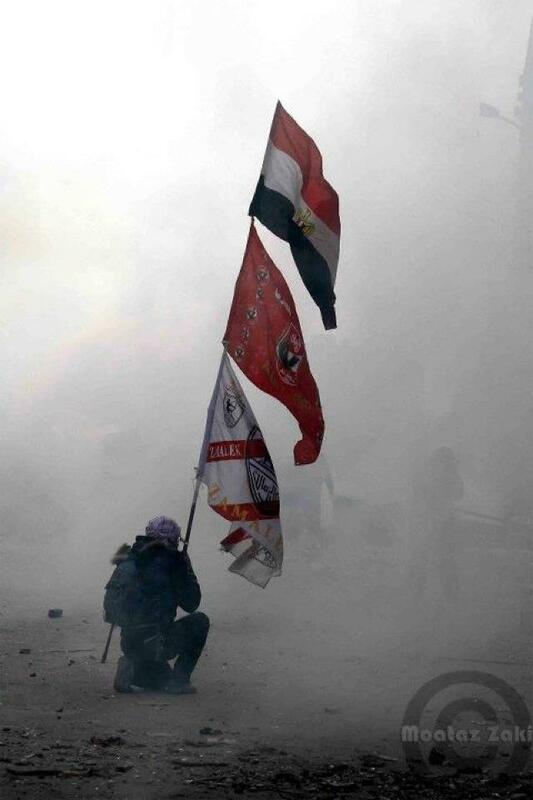 There was a revolution in the winds that blew over Egypt. There was a freedom that would be taxed. The angel of death this year was the tax collector, demanding the debt on a freedom over due to be paid, by the young. And all year Egypt’s bravest were paying the price for generations that had lived and died on the land without ever questioning why it was embedded so deeply in their conscience that they did not deserve the rights so many had lost lives struggling for in other parts of the world. I go through a continuum between rage and cringing when I hear people speaking of their plans for “celebrating” the coming 25th January. My immediate response is: celebrating what? Celebrating the death of hundreds of Egyptians killed at the hands of those who were meant to be protecting them? Celebrating the humiliation of those arrested/kidnapped by the forever present men of Mubarak’s regime? Or are you celebrating the good aim of the officers who blinded your youth? Perhaps you are celebrating the beatings of elderly women? No? That’s not what you’re celebrating? Freedom maybe? Celebrating the 12,000 men, women, children on military trials? Thinking that freedom exists on the side of prison bars in which they sleep. As long as freedom fighters spend the night on the cold asphalt the other side of the bars we’re on, then we are not free. If we think we are, then we have not only deceived ourselves, but have betrayed those inside, whose only hope is that we remember them and don’t let go of the fight still waiting to be fought. At any celebratory event in this age, we usually see a display of photographic shots that capture the essence of the journey towards that moment of triumph we’re celebrating. Which of these pictures will fill the square? The one of the soldiers dragging the dead into the rubbish piles? 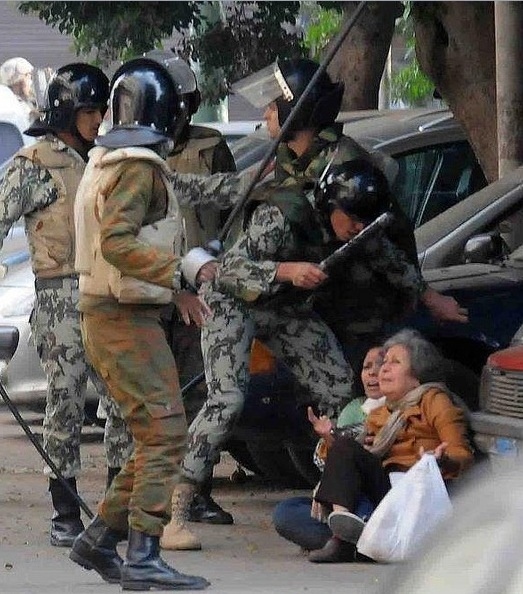 The one of the two old women beaten by the army while they crouch unarmed on the floor? 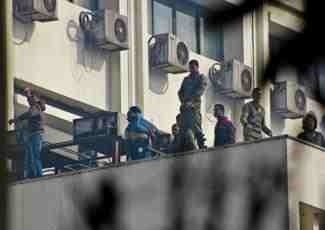 The one of the soldiers urinating on the protestors? But even if these aren’t the pictures you’ll be using, even if you use the ones where the people are giving the army roses in February, then you are putting on display pictures that capture betrayal of the confidence obviously misplaced. I’ll be first to wrap my hips and dance in celebration of this revolution when I don’t hear of hundreds unable to find gas for their homes, when they don’t stand hours for their share of bread when my fellow citizens are not more concerned why I was protesting than what I was protesting for. I will ululate when the execution of the law is predictable and reliable. When there is social justice and I am respected for my humanity then I will draw the posters of celebration myself. The Egyptian flags that will be raised in triumph “celebrating” this revolution will not be big enough or bright enough to cover the blood and shame of killing the unarmed innocent, not big enough to cover up the lack of reason for locking away the brave who risk and give up much to say “NO!” to injustice. Those who lost their lives fighting for this revolution died for something we still haven’t had a taste of; were blinded and blind folded to give it life and hope. What they exchanged their lives, limbs, eyes and freedom for has still not been delivered, the deal has not yet been sealed. Only one side has paid and so as far as I’m concerned, there is nothing yet to celebrate.